This is a limited edition of 500 pieces issued by Revell in 2011. 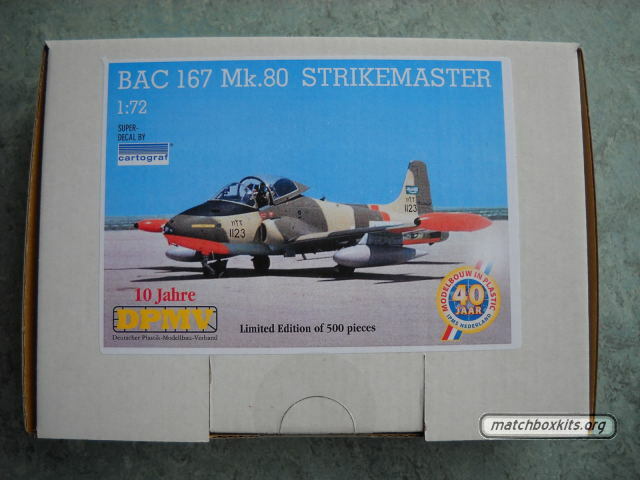 The BAC 167 Mk.80 Strikemaster is a rerun of the PK-10 mould with new Cartograf decals. It was made for the special occasion of the 40th anniversary of the Dutch IPMS (International Plastic Modellers Society) and the 10th anniversary of the DPMV (Deutscher Plastik Modellbau Verband). The sprues were made on the only injection molding machine that is still being run by Revell in B�nde Germany. Usually this machine is used for test runs. In this occasion two shades of brown were mixed so that each kit became unique.